Last year, Erik was traveling a lot for work. Sometimes up to a month at a time. It was really important to us both that he still be able to vote so he signed up to cast his vote via absentee ballot. Now he doesn't travel anymore for work, but works a set of hours that we are all familiar with- so he continues to vote in this way. On his way to the mailbox he dropped his presidential absentee ballot and thought, "This absentee ballot is a metaphor for my life." That was incredibly sad to hear, and yet it is painfully true. He leads a double life .Chef and Erik. We talk all the time here about the things these chefs miss in life, but we rarely talk about how it affects them. I see my husband breaking down sometimes, getting overly tired, and drowning in his work. It never lasts long, but I think we should all be taking some time to consider the other side. I think this is a metaphor for most Chef lives... 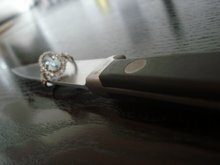 I feel like us, as wives, are often quick to judge and nag, because we don't truly understand the life they live. Taking time to consider their side of things, and the exhaustion they feel due to the situation, is something I try and make time for at LEAST once a month. Sometimes its hard to look past my own feelings, but I have to at least try and look at my Cheffy's feelings. I find it makes our relationship a lot better! You are absolutely right! We often get overwhelmed with our own feelings and forget the stresses of our spouses. Thank you for brining us BACK, theotherFaith. Looking forward to checking out your blog right now! I have to tell you how releived I felt when I came across your blog. I am also a "chef-wife", and often feel lonely with my my ghost husband. I am 30-something, and most of my friends are married & starting to get settled in their respective lives. We don't have children yet, so I do have a lot of free time to myself. One of my ways of coping & connecting with my husband & pass time is that I tend to periodically tackle these day-long culinary projects (i.e. making everything... I mean everything from scatch) in hopes to impress my husband when he comes home. He is always appreciative, and genuinely seems proud. However, once I'vd occupied myself for several hours & finished what ever dish I decided to create, I find myself waiting around for my husband to come home. After all the food shopping to the "right" grocery stores for the "best" butcher shops & hunt for the optimal ingredients to perfecting my mise-en-place over several hours... in the end... I am still waiting for my chef-husband to come home & feeling a bit lonely. Anyway-- this is something I've vented about to my friends, and it's so hard for anyone who doesn't have a chef-husband to relate. Sometimes I feel like my friends/family look at me like I'm making it up that I don't bring my husband around to my any events on weekends. They always look so surprised [EVERYTIME!!!] when I say he's working on a Friday/Saturday/Sunday. 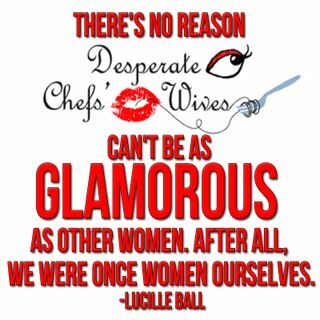 Anyway-- sorry for the lengthy message... but I just want to add that I appreciate the blog, and it's comforting to know there are more chef-wives out there!! 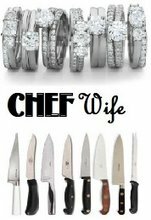 I, too am a desparate chef wife. We have two children and I work a 45+ hour work week while he works... well, you all know how much he works! It can be SO daunting and difficult for us that it is certanly easy to be caught up in our feelings, our own lonliness to forget the other side. Thanks for helping to bring me to realize that! I think it is easy for us to be frustrated that they miss so many things, but I often forget that it is hard on my chef/husband to be missing them as well. Thanks for the reminder.